DynoTune Product, 306-Nitrous LED Purge Light Micro Package - DynoTune, Nitrous systems, Purge kits, Nitrous Bottle heaters and more! This Device will illuminate your purge for a dramatic effect at night! Scare the competition and look great doing it. Great for bikes as well! One super intense LED will last for years and years without failure. Mounts onto standard 3/16" steel Tubing! Fits through the center of LED and a set screw secures it in place. Note: This Item does not come with a purge kit, just the purge light assembly! Add the micro purge led Installation kit to your cart if you need the tube and hardware to work with your solenoid. 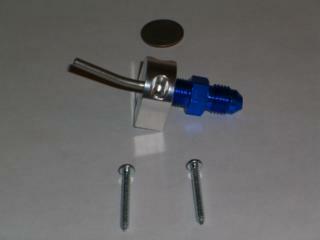 The install kit will come with the 3/16" tube and the -3an blue nut/sleeve, a blue -3an blue fitting for the solenoid. Another mounting option is the billet mounting block and a braided line. The billet block will hold the 3/16" tube but it can be remote mounted and the bradied line will connect the solenoid to the billet mount. order your -4an braided line in the line section.